For the final inspection of products Dowald uses test benches which are designed and manufactured in-house. Based on its continuous improvement process, Dowald extends the existing test facilities or sets up new ones. All systems have to undergo leakage and functional tests at high pressure and low pressure, leakage and functional test according to a defined test procedure. The test results are archived with reference to the serial number and are on request available for the customers. All systems are tested according to production test procedure on specific test benches. All sliding steps and entrance systems pass a serial test according to the defined test procedure. 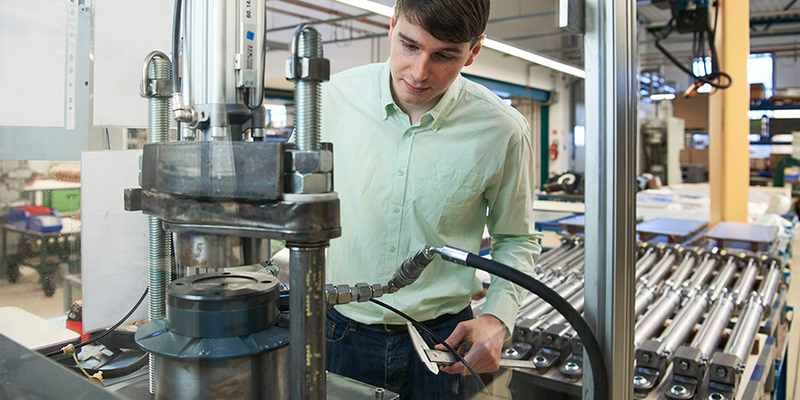 Dowald checks all hydraulic cylinders concerning function and leakage. The test pressure is defined according to customer specifications. For the testing of levelling cylidners Dowald has designed a special test bench. Apart from the functional test, this test bench is intended for the assessment of internal and external leakage and breakaway pressure.